Prevent large birds and squirrels from eating all your bird food! You save money on seed when you use a Yankee Dipper. Lifetime Warranty against squirrel damage. The Dipper’s four seed ports have individual weight sensitive perches. The positioning encourages smaller songbirds to eat, but prevents all squirrels from feeding. Each perch is individually sprung and calibrated for birds up to the weight of approximately 2 ounces. 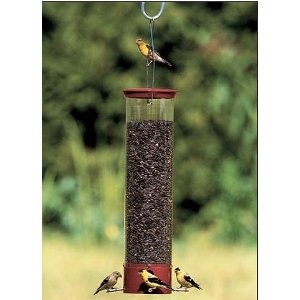 The 4-3/4" x 21" long clear feeder tube makes the seed visible to the birds, a proven advantage. Made of UV Stabilized Polycarbonate, it ensures long lasting durability without yellowing. Its length and girth are designed to prevent squirrels from reaching the seed ports. With a large 5 lb. capacity, you don’t need to refill your feeder every day. Metal cap and feeder base are powder coated in a rich burgundy that complements any yard or garden. Hang the Dipper securely from its heavy duty signature looped stainless steel wire which reduces motion.